The best place to stay in the heart of Amsterdam! Chic, spacious, sunny, & rustic. Extraordinary view on Canal & Royal Palace. Right next to the hip 9Streetdistrict and Jordaan, you'll find exquisite coffeebars, great restaurants & boutiques. A special hide out. Feel at home, fill the house with love. An authentic 17th century Loft with all the modern comforts you need. Oak wooden floors, historical details and windows that let in lots of sunlight. When the sun goes down the atmosphere is fairytale-ish and very romantic. The living has a super high ceiling, mindblowing mirrors, a great collection of art books and a cozy window-sill where you can lay down or sit, while watching the characteristic Amsterdam life and boats go by. 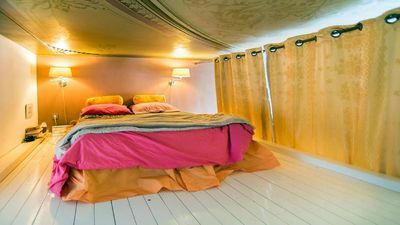 The cozy and comfortable bedroom is build on the vide and overlooks the whole loft. The classic kitchen provides everything you need including dishwasher, washingmachine, blender & oven and Italian coffeemaker. In the relaxing bathroom you can chill and spend hours in the tub. Create your own candlelit sanctuary. A bit of history: Back in the 17th century a wealthy merchant and his family owned this building, and this apartment was the ‘stijlkamer’ the salon where they received and entertained guests. Some fifteen years ago a bedroom vides was built. WiFi -Bath/Shower -Cable TV(HBOseries) -Speakersystem -Fully equipped kitchen -Washingmachine, Dishwasher -Clean towels/fresh linens and a beautiful terrace on the private backside. A list with updated To Do's and Hotspots will be waiting for you to inspire you during your stay. Ofcourse you can always contact me for further tips and tricks. The loft is situated at the Singel Canal right in the heart of the city. Public transport is all around to take you everywhere. Rent a bike around the corner or try something fun & new and rent a waterbike! You are welcome after 13.00 and checkouttime is 1100, but we can talk about it. I trust you to treat the the house with love and respect. The loft is very personal.